Steve Smith with a young caster. If you have been thinking about giving fly fishing a try, check out the Miramichi Fly Fishing School. The Miramichi Fly Fishing School is only a stone's throw away from the Bartholomew and Miramichi rivers in New Brunswick, Canada. New Brunswick is home to some of the best Atlantic salmon fly fishing, which makes it a perfect place to offer fly fishing courses. These courses will definitely give you a jump start on a great sport. The courses are designed to help and improve both beginners and experienced fly fishers, with an emphasis on Atlantic salmon fishing. They provide you with all the equipment needed for the course, but suggest that you prepare yourself for various weather conditions. Watch this video for a few basic fly fishing tips. 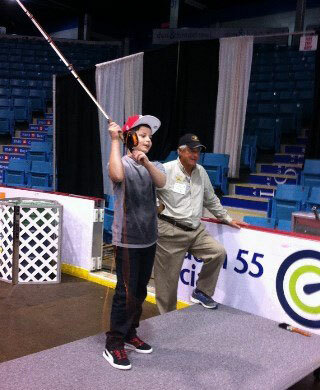 Steve Smith, Master Fly Casting Instructor from the Miramichi Fly Fishing School, demonstrates how to fix fix faults in your fly casting during the Dieppe Fly Fishing Forum-Moncton boat show 2016.